The tourists have left, but the ferry is full. Greeks know that September is the best month to experience the islands in an unhurried way, without the maddening crowds of high summer. Our boat over from Lavrio was stupendously packed--as in, I've never seen it so full. That's what happens on Friday when there are seven weddings and one christening in one weekend!!!!?! Apparently everyone's Uncle Taki and Aunt Voula are back from their August ventures and ready for a Big Fat celebration. Luckily, we're tucked away enough not to notice the surge of September. We're hunkered down amidst the blue sky and puffy clouds putting our noses to the grindstone and working to mill out all those summer projects that mysteriously remain incomplete (eeek the backlog of photos and recipes!!!! I'll be posting about sun tea in December, it seems!!). So, today is not a big cooking day. I cut the peaches that were beginning to turn and put them in the fridge, content that I'd done something in the kitchen before chaining myself to my laptop. this peach came with its own custom-made hat which I didn't even NOTICE until after I bought it. WIN! Mihalis, lacking my peach dicing pleasure, jumped up at 12:30 and began to make kayana. He calls it kayanaaaah, others call it kayanaaahs. Whatever you call it, it's simple, delicious, and quickly prepared. Perfect for a work day lunch. TIP: Tomatoes love a little bit of sugar. They're sweet already, but just a spoonful of sugar helps the tomato to sing like Mary Poppins. Dash in a bit and your tastebuds will thank you. Supercalifragilisticexpialidelicious. wash and cut tomatoes into bite-sizable bits. 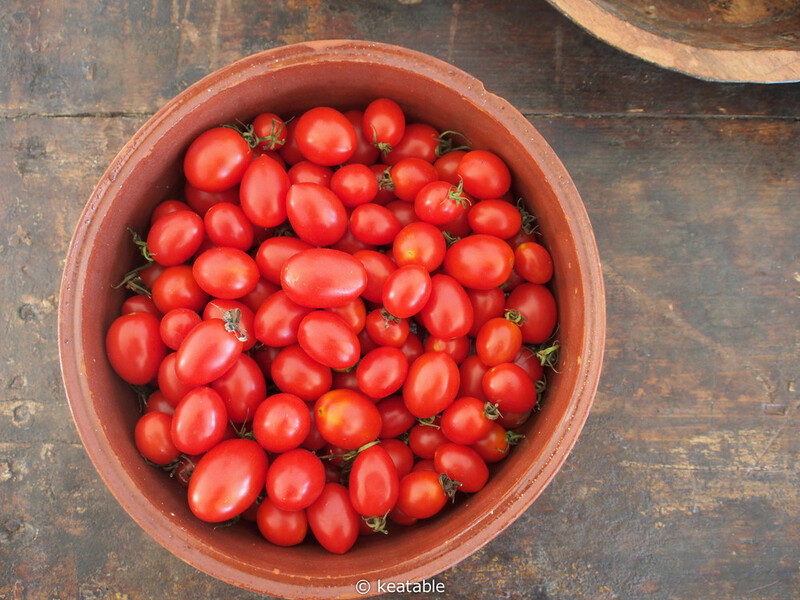 put tomatoes with oil and salt in a frying pan over strong heat. they will caramelise just a bit and weep out water. let them boil with their own juice a few minutes. if they seem to dry up too quickly, add a bit of water. after ~4 minutes, reduce the heat. add a bit of sugar. Keep cooking until they are fully soft, usually ~15 minutes. like before, if they seem to dry up, add a bit of water. before you put the eggs, add a bit of oil if need be. Need be = if the sauce looks too watery and there's no sign of oil. No need = it looks like a yummy chunky sauce you'd want on your spaghetti. break the eggs into the pan. 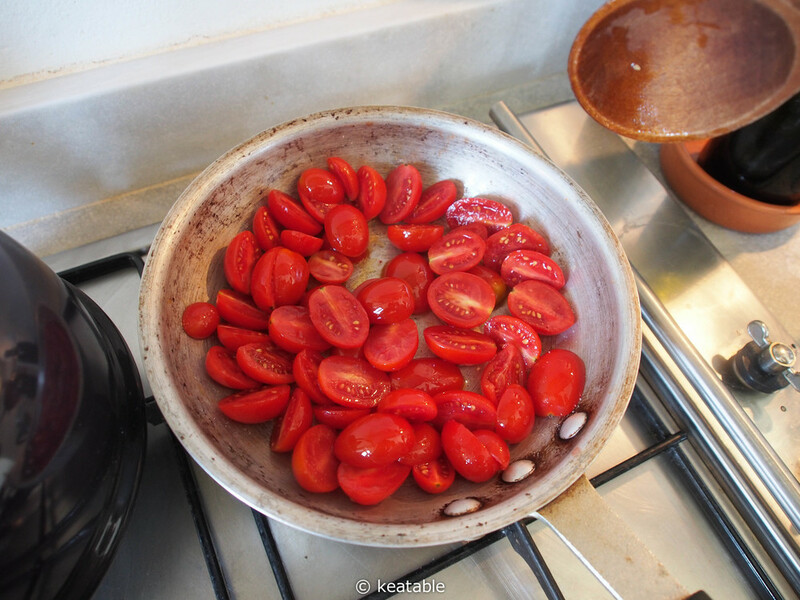 let them fry/poach with the tomato until they reach your preferred state of doneness. TIP: when you see the egg whites start to solidify, you can put a lid on for ~2 minutes to help the yolk set.